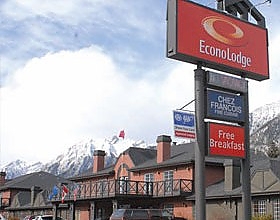 Welcome to the Econolodge Canmore Mountain Lodge, a multiaward winning hotel offering you outstanding value during your stay in Canmore. Featuring easy access from the TransCanada Highway and close proximity to the downtown core (a 5-minute walk), the hotel offers a relaxing four season mountain getaway for everyone. The hotel offers 60 spacious rooms featuring bar fridge and free wireless internet in every room, plus other rooms featuring microwave, gas fireplace and jetted tub for your additional comfort. Guests looking to make use of our other on-site facilities will also enjoy our fitness center and the chance to grill your dinner in our private BBQ area. Dining is always convenient with the award-winning restaurant Chez Francois on site and a range of family restaurants, pubs and unique dining experiences only minutes away on foot or by vehicle, and our complimentary continental breakfasts always receive excellent reviews. Groups and Meetings are well catered to, with meeting facilities for up to 80 people and outstanding lunch options provided by our local caterers. At the Econolodge Canmore Mountain Lodge we take great pride in meeting your every need, with clean and comfortable rooms, a 100% non-smoking environment and easy accessibility with the majority of rooms on the same level – and like our partner hotel Best Western PLUS Pocaterra Inn our strong environmental program means your stay will have minimal impact on our pristine wilderness surroundings. 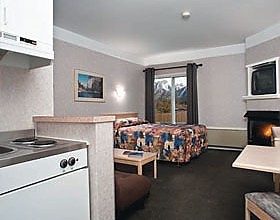 We look forward to welcoming you in Canmore.